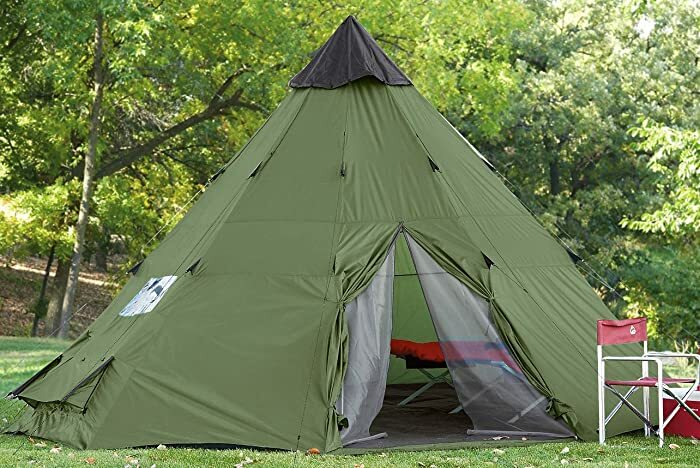 The teepee tent is one of the most uniquely shaped tents on the market today. These tents feature a pyramid shape and they have a high center pole with much-needed headspace. These tents traditionally look the same as some of the old Native American tents made from animal skin to keep them protected from the elements. The best teepee tent for camping might be quite tough to find if you are not an avid camper, but they do work perfectly for camping in rugged conditions. The only place they might lack is when it comes to excessive wind and since they are not as wind resistant, it might cause troubles. That said, read on to find out how to choose a teepee tent and which ones are the best! 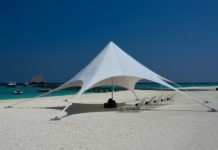 Before selecting a tent, you will need to understand some of the basic features these tents will offer. This enables you to make a better decision and choose the tent you like with much greater care. 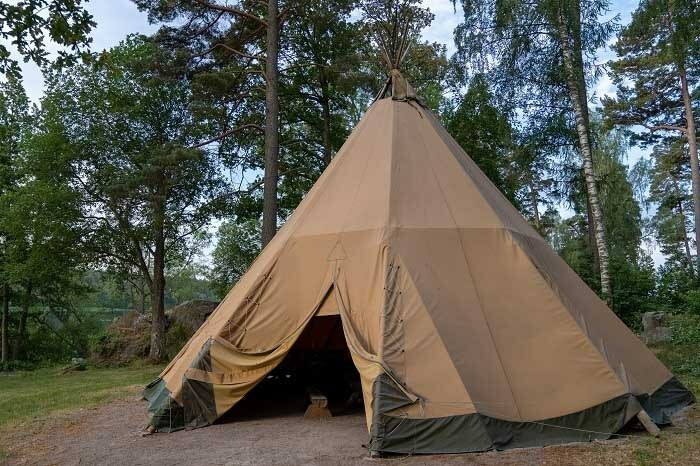 After conversing with a couple of experts, we have found the top features you need to be aware of when selecting your very own teepee tent. One of the first questions you should ask yourself is how much space you will need to enjoy your trip and keep everything safe. Depending on this, you will decide on the size of the tent. When it comes to teepee tents, you will find that they are generally quite large and offer decent storage space for a camper’s belongings. If the tent takes too long to set up, you might be caught up in storms and this could make the setup process a little harder. It is also important to note that certain tents do have more intricacies and this will make them harder to set up. One thing you could do to minimize this risk is to practice setting up the tent in the comfort of your yard before heading out. With any tent, the durability is an important feature and the materials of the poles and the cover are generally what you should look at. The tent poles will keep the tent stable and the best material one could consider to use is carbon fiber; however, aluminum is also quite strong and you could save a couple of extra bucks. 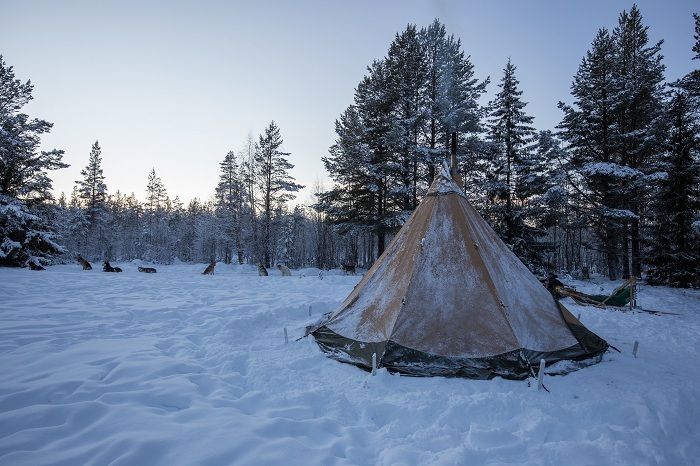 Teepee tents are generally used for camping in humid weather, but they still offer decent protection for those camping in the cold. Out of our experience, we would not recommend them for the Arctic. The tent should definitely have decent ventilation for camping in the summer. Without ventilation, you might be caught up without the ability to sleep on those hot summer days. While camping is fun, backpacking is one of the ultimate tests you could endure. Many campers love to take on backpacking in their free time and this is where the weight will become an issue. The lighter the tent, the less fatigued you will feel when walking prolonged distances with it. We recommend keeping the weight in mind if you are someone who is into backpacking and might need to use the tent for this purpose. With decent ventilation and lightweight materials, you will still need to ensure that the tent is waterproof and you are capable of using it in the wet weather conditions. If the tent is not waterproof, you will still have the luxury of using a waterproof spray to ensure that all the cracks have been fully sealed off. The days of using a standard tent have long been phased out and people are now looking for tents with additional accessories to help them enhance and simplify the camping experience. We have tested a couple of these tents and found some of the accessories that you might be inclined to search for when looking for a tent. 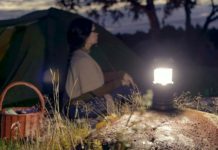 - Electric cable sleeves: Modern camping sites will now offer electricity for users if they might need it and this can be relayed to the tent with an extension cord. To ensure the cord is not in the way, some of the modern tents now include sleeves that will be ideal to thread the cord through and keep it out of harm's way. - An included tarp: Having a tarp or tent footprint is ideal for keeping the tent insulated and protecting it from the weather, while these can be purchased separately; they sometimes come included in the tent footpri﻿﻿nt. - Additional vestibule gear: Having additional accessories that could help you is a great benefit if you are camping with your dog and need storage spaces. Having additional things like a dog toilet will keep the dog inside at night. There are also many more features that you could look for in some of the high-end tents. 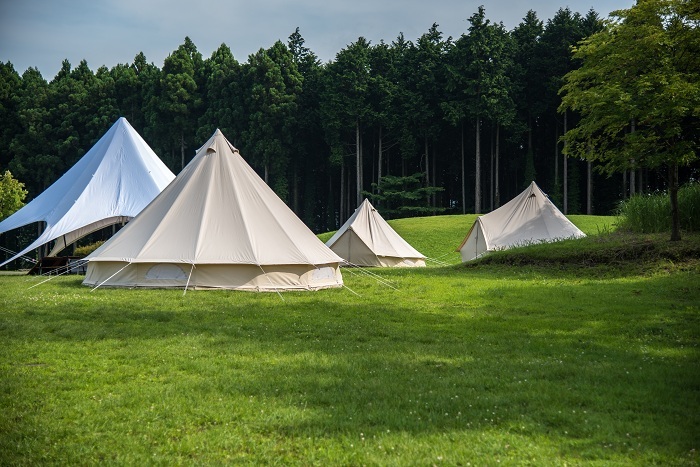 Now that you have a better understanding of the main features that you need to consider, you might also feel like you would like to know which of the teepee tents are considered the best on the market. 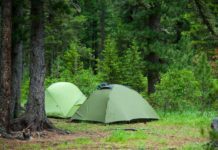 Fortunately, we have had the opportunity to test out a couple of these tents and find out exactly which ones are the best rated on the market today. First, on our list, we have the Guide Gear 10x10' Teepee Tent and this tent is designed from durable materials and a steel tent pole. While the steel tent pole might be a little heavy, it is perfect when it comes to stability and the metallic finish help eliminate the conductivity of electricity from lightning storms as well. It is quite large and fits around 2 camping cots comfortably, with the ability to store some gear, without the cots, you should easily fit 4 people inside with gear that is protected from the weather. Since the tent is quite small, it is really easy to set up and should only take one person to do this comfortably in around 10-minutes. For the size of the tent, it might be a little expensive, but we would still recommend it for the quality and the value to the most avid campers. It does come with a rain fly, but you will need to seal the seams as the tent does have a tendency to leak and allow the water to get inside. This tent will not be ideal for weather storms. 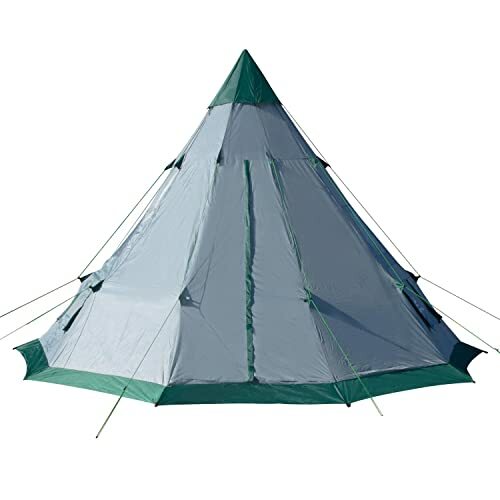 The Guide Gear Deluxe Teepee Tent 14' x 14' and this tent is designed from top quality materials and features an extremely lightweight for backpacking as well. The tent is extremely large on the inside and should be perfect for large groups of people to enjoy camping or backpacking. It offers excellent ventilation, but once again, lacks some waterproofing abilities and you might need to add a seam sealer before heading out. The tent is also quite affordable and we would definitely recommend it to anyone who enjoys camping in hot weather conditions. Made from 210T polyester, the Winterial Teepee Tent is extremely durable and only weighs around 15-pounds. The tent is quite large and accommodates up to 7 people with limited gear, but could handle around 3 camping cots with gear as well. It is quite easy to set up and should take one person around 5-minutes. The tent comes with a waterproof cap and a tarp for extra protection from the weather. It features an extremely stylish design with decent ventilation that will keep you cool during those hot and humid days. The one fatal flaw we found is the lack of mesh covers and this presents the opportunity for bugs to craw inside from the roof. It is also quite expensive, but the lighter weight gives users the additional ability to go backpacking as well. We would recommend this tent to larger families or groups backpacking prolonged distances in the wild. 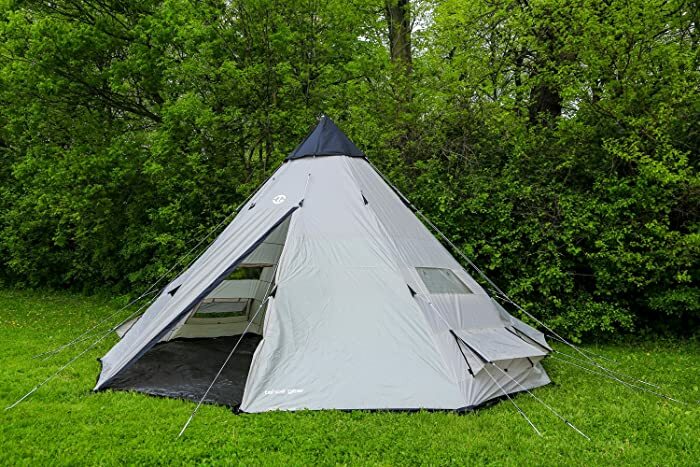 If you are more than one family of about 10-12 people, the Guide Gear 18x18' Teepee Tent should be the ideal camping option. 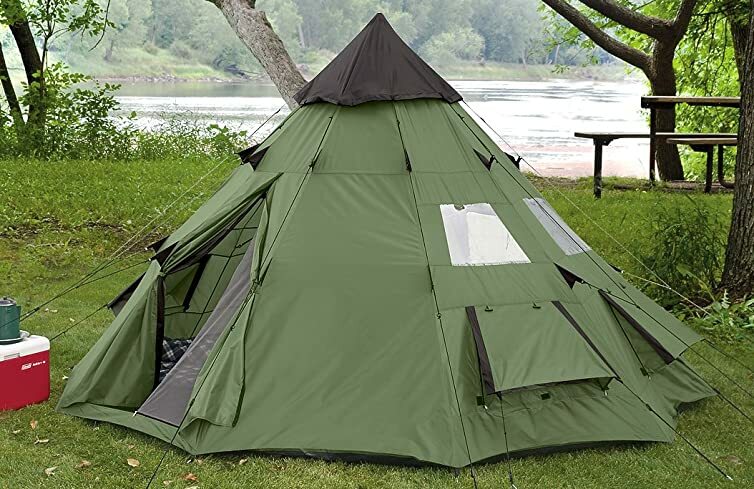 The tent is quite tall at almost 10-inches and made from extremely durable materials that will explain the quite expensive price tag it has. With lots of headroom and space, the tent takes quite a while to set up and you will definitely need someone to help you with the setup. We spend around 15-minutes with the setup as two people, but with more people, this could be reduced. Unfortunately, the added space does limit your camping space and you will be quite pushed for space when camping out in the bush. The tent also requires some extra waterproofing to ensure the rain does not get inside. While the tent is quite large, it is also heavy and requires a little extra time and planning to set up. It will also limit your available camping space, but if you find a large open area, the tent will be perfect for all weather conditions. It is quite affordable as well when compared to some of the other large tents on the market today. Now you should have the knowledge about the best teepee tent for you and your family to enjoy the camping activities. While these tents are particularly great for extremely cold weather, they do offer some great benefits for the other seasons. 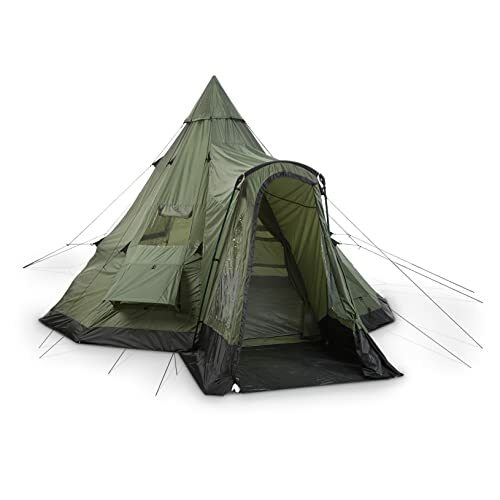 We have decided to choose the Guide Gear Deluxe Teepee Tent 14' x 14' as our choice for the number one tent. It offers all the benefits of the larger tents at a more affordable price. We would also like to encourage you to let us know which of these tents you would choose and if we might have missed any of your favorites. Next articleTent Vestibule (What Is A Tent Vestibule?) Find Out Now!